Paphos has many villages just on its' outskirts that are popular places for retirement homes, family or holiday homes. At Cyprus101, we are putting together a list of all the villages by location so you can learn more about them. Location is key when choosing a property and we want to make sure you choose a property in the perfect spot for your lifestyle. Whether you like a quiet and traditional Cypriot village or a larger more bustling village closer to Paphos town we will tell you the highlights and what makes each village special. To the north of Paphos, leaving Paphos town the first village you will find is Emba. Continuing on past Emba you will find the popular village of Chloraka with many tavernas and all amenities and properties with great sea views. Past Chloraka, there is Lemba Village, home of the Lemba Art College and then the lovely village of Kissonerga. Until you reach Kissonerga you can access these 3 villages by way of the Tombs of the Kings road in Kato Paphos or from Paphos town. No matter what path you take, you will arrive at the scenic stretch of the Coral Bay road taking you into Coral Bay itself and Peyia. A little farther along the same stretch leads you into the Sea Caves and Agios Giorgios area - both which have many exclusive and luxurious properties. To the South of Paphos and past the airport are many of the newer areas of development. The first villages as you exit Paphos (towards the airport) and beyond are Yeroskipou, Koloni, Timi, Anarita, Mandria, Kouklia, Secret Valley, Aphrodite Hills and finally Pissouri. To the East of Paphos, taking the round-about by the electricty authority are the villages of Konia being the first village as you exit town then, Marathounda, Armou and Episkopi. To the North East of Paphos following the Polis road (where the industrial area is) there are the villages of Mesa Chorio, Mesogi, Tala with all of it's views, Tremithousa, Tsada, Koili and Polemi. 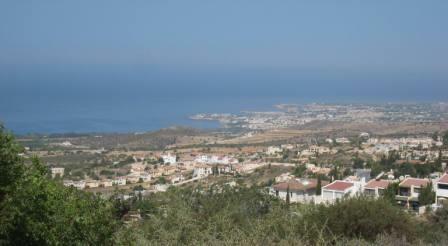 About halfway between Paphos and Polis and worth a mention are the quaint villages of Drousia and Kathikas. *Please feel free to tell us why a village is special to you and we will include it on our page. Search Paphos Cyprus Property Now! Search Paphos Cyprus Property Now! Browse Agios Georgios Property! Browse Aphrodite Hills Property! Browse Armou Property! Browse Chloraka Property! Browse Coral Bay Property! Browse Emba Property!